Brave New World: Are Books Merely a Form of Physical Decoration? Some will say we are party poopers and that we should applaud and celebration the British Museum’s novel use of the book to create art, but is the ‘wheel of books’ just a cheap gimmick or we should we be mindful of what could be easily copied? The British Museum’s newly refurbished bookshop got Lumsden Design, who are based in East London, to create their space and engage customers. At is centre is a two metre ‘wheel of books’ which sits proud in the shop’s window. It has caught people’s imagination and has engaged, but is it about promoting books for reading, or promoting them as objects of decoration? Is it simply reusing them to create a decoration and a one off piece of eye candy which is in fact in conflict with the objective of reading, or is it a subtle way to promote the book? After all we often love to see shelves of books face out, or stood to attention with their spines outs and is this any different? What will be the legacy of the ‘wheel of books’? Will people now buys books to glue them together or to drill holes through them in the search of expressing themselves through art? Will schools now collect old books so their kids can create art and forget to read them? Will this decoration promote books as a tool for learning and an escape to fantasy or simply turn them into objects to be twisted, broken, and stuck together in the search of art? Will second-hand books now be snapped up by the yard to be experimented on in art classes and colleges? We do applaud the other creations within the shop, which includes tabletops wrapped in black leather to recreate the original writing desks in the Reading Room where Karl Marx, George Bernard Shaw, Thomas Hardy, George Eliot and Rudyard Kipling all studied. It has also embraced the Rosetta Stone right down to the sales of merchandise such as umbrellas and cufflinks. 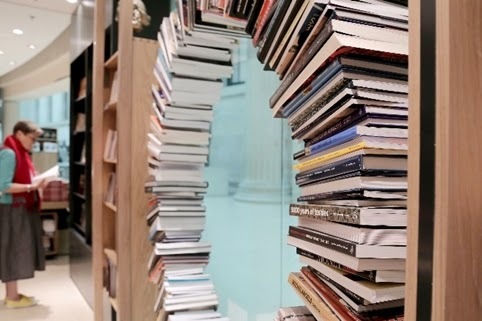 But it is the ‘Wheel of Books’ that causes us to ponder, with its metal ring piercing through all the copies on the wheel, in order to keep them all in place just to create window art. A few years ago some industry bright sparks thought that instead of pulping books, or sending them to landfill, prisoners in Her Majesties prisons should drill holes through them and in doing so stop them being resold, reread and shared. Thankfully the move was questioned and shunned, but today have we now discovered the acceptable alternative? Same result, holes drilled through the books rendering them unusable, but this time it is all done in the best possible taste.